Sweaty palms, racing heart, inability to focus, and imagining the worst-case scenario are part of just another visit to the doctor’s office waiting room. Iatrophobia, the fear of doctors, is a real thing, and is what our children often experience when we take them to the pediatrician. The waiting room can be a huge trigger of anxiety because our children see other kids who are sick and uncomfortable, hear kids screaming and crying, and fear what will happen to them once their name is called. For years, experts have been suggesting tricks to help get our kids through their exam, such as bribing them with a treat afterwards. But there is a much better way: mindfulness. This approach is one of the most effective ways to instill a sense of calm at the doctor’s office that our children can tap into anytime a challenging situation arises in their lives. Mindfulness is the practice of being fully present in the moment in a non-judgmental way. It allows our children to better understand their mind-body connection, and to stop being so reactive to thoughts, emotions, and physical sensations. Mindfulness helps them stay focused no matter what is happening in their environment. According to numerous studies, mindfulness helps us reduce stress and anxiety when faced with uncomfortable situations like a dreaded visit to the doctor. 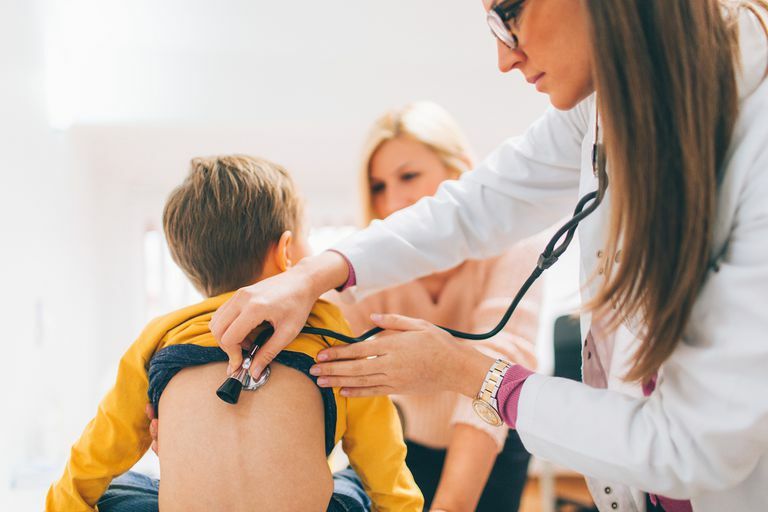 Next time your child is feeling panicky about a doctor’s appointment, try using these mindfulness tactics to distract and calm them. Mindful breathing has been scientifically proven to minimize stress and anxiety. Teaching children to breathe mindfully by using games is a great way to pass along an important stress reduction tool to them in a fun, playful way. Try these creative breathing games while they are getting a shot or having their blood drawn, or simply freaking out in the waiting room. Expandable Sphere: Bring along a Hoberman mini sphere toy with you to the doctor’s office. It is a clever way to demonstrate the breathing process to children. As this video shows, the sphere is expanded while the children breathe in and collapsed while they breathe out. Heart Hands: Similar to using the sphere, have your children create a heart shape with their hands. As they breathe in, they can expand their hands into a heart shape. As they breathe out, their hands collapse into two fists side by side. This is an easy on-the-go exercise since no props are necessary. Birthday Candle: Ask your children to pretend they are blowing out a birthday candle. They should take a deep breath in and then push the breath out as if they are extinguishing a fire. The more stress they feel, the more birthday candles they should imagine blowing out. Point out FIVE things they see around them in the waiting room. Feel free to ask them to describe each item and what they like about it, or what it reminds them of. You can even have them tell a story about each of them. Have them touch FOUR things. It could be their hair, clothing, chair, carpet, your handbag, etc. Ask them to describe what each item feels like. Can they find THREE things that they hear? Some examples are the tick tock of a clock, a phone ringing, people talking, the rustle of magazine pages, or the air conditioner. It might be extra fun to have them do this with their eyes closed so they can really focus on the sounds. Ask them to find TWO different smells in the room. They may need to get up and walk around for this one. They may smell someone’s perfume, lunch, or even a baby’s dirty diaper. Ask them to tell you if they like or dislike each smell. Find ONE thing that they can taste. This is a good one to be prepared for with a couple of snacks in your bag. If you do not have anything, ask them to describe the taste of the inside of their mouth right now. Or even ask them to talk about what they wish they were eating at that moment. You can take any of these steps to another level by bringing along some props. With touch, for example, you can bring a touch and feel book for a young child or a small bag filled with various items for an older child. Some ideas to include are a tissue, sandpaper, a cotton ball, a squishy ball, and a piece of felt. For the taste activity, you can bring along a snack and try a mindful eating exercise such as The Last Orange on Earth or Mindfulness and the Art of Chocolate Eating. Another really simple way to calm your children down in the doctor’s office is to have them do some coloring. Creative activities like coloring have been scientifically proven to reduce stress levels because we become so focused on what we are doing when we reach a state of “flow” that we forget what is going on around us. This is a terrific way to focus on something more positive, productive, and inspiring. Coloring is a fitting tool for the doctor’s office because it is not messy, no instructions are necessary, you can easily bring along a coloring book and pack of crayons or markers, and children love it. In order for your children to get the most benefit, let them focus on coloring without the pressure to stay in the lines or follow directions. Finally, teaching your children how to practice a personal lovingkindness meditation is extremely helpful while waiting to see the doctor. Also called metta or compassion meditation, lovingkindness meditation is one of the most commonly practiced types of meditations. Its purpose is to direct positive thoughts and well wishes to ourselves and others. Research shows how lovingkindness meditation leads to positive changes in the brain. These thoughts help your children feel more relaxed, lift their mood, increase feelings of hope, and decrease physical and emotional pain. Ultimately, they will begin to feel better about themselves and be less concerned about what will happen when they see the doctor. You can write down the meditation on an index card and bring it along with you to the doctor’s office or practice it often with your children so they memorize it. They can feel free to recite it out loud with you or silently by themselves. Various age groups will enjoy practicing this meditation in different ways, and their preferences will change as they get older. They should start by directing the phrase to themselves. Next, they can direct it towards someone they feel thankful for or who has helped them. The next step is to visualize someone they feel neutral about and direct the thoughts to that person. Next, they can direct the thoughts to someone they do not like or who has caused difficultly (such as the doctor or nurse they are scared of). Finally, they can direct the metta towards everyone universally: May all beings everywhere be happy. The next time you need to take your children to the doctor’s office, consider trying some of these mindfulness games to keep them happy and calm.